As water is exposed to different contaminants in the manufacturing process, it becomes wastewater—one of the manufacturing industry’s biggest by-products. Before that water can be released into natural reservoirs or recycled for other uses, it must undergo rigorous treatment. In an effort to dramatically cut costs and drive sustainability, more and more industrial facilities are choosing to treat wastewater on-site and recycle it back into the manufacturing process. To do so, they rely on multistep wastewater treatment systems to remove harmful bacteria, chemicals, and both organic and inorganic compounds from the water. Technology like reverse osmosis systems, ultrafiltration systems, vacuum evaporators and filters, paper bed filters, solid bowl centrifuges, and tramp oil separators are used to both neutralize and remove impurities from the water. 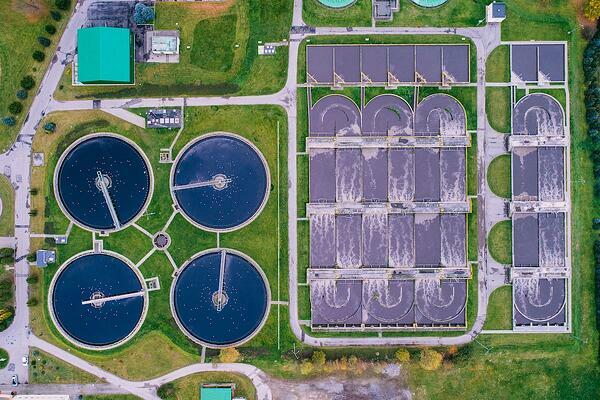 Although these systems save millions of dollars in wastewater disposal, transportation, and water sourcing costs, they require diligent oversight and maintenance in order to function properly. To maintain the integrity of these systems, ensure the safety of the industrial plant, and guarantee the cleanliness of the end product, industrial manufacturers rely on four additional types of equipment to oversee wastewater treatment. As the name suggests, these instruments are used to maintain specific liquid or gas levels in pipes, tanks, or silos in wastewater treatment systems. Because treatment pipes are typically opaque and difficult to access, it’s impossible to determine the amount of liquid or gas present based on visual cues alone. Instead, system operators rely on level radar, sensors, and transducers to monitor current water levels. Instruments like radar, transducers, and switches are often connected to alarms, pumps, or controllers to automatically adjust water and gas flow based on incoming data. Whereas continuous level instruments are designed to provide consistent measurements, point level instruments transmit readings only in the event that water levels reach preset extremes as a means of preventing overflow. Flow instruments are used to determine the amount of fluid or gas that’s present in an enclosed pipe as well as the rate at which it’s moving through the vessel in question. These instruments are typically installed into wastewater treatment pipes and are designed to measure volume and mass at regular time intervals. Using this data, operators are able to monitor flow volume and mass flow to maintain the safety and functionality of their treatment equipment. Examples of flow instruments include variable area meters, mechanical flow meters, magnetic flow meters, thermal flow meters, and pressure-based meters. The data provided by flow meters is often used to trigger flow switches, pumps, or supply valves. This blanket category includes pressure transmitters, sensors, transducers, and gauges. Like flow instruments, pressure instruments are typically installed into the pipes, pumps, and reservoirs of wastewater treatment systems. Some pressure instruments will measure flow rate and fluid levels in addition to pressure, filling the function of both a flow and pressure instrument. In doing so, they help industrial facilities maintain safe pressure levels and prevent equipment failure. The type of pressure instruments required depend on the testing conditions, the accuracy required, and the specific type of pollutants in the wastewater. Water quality monitoring instruments are integral to industrial wastewater treatment. Before treated water can be recycled back into the manufacturing process or released into sanitary sewers, it must meet national and local water quality standards of cleanliness. Inline water quality instruments are installed into wastewater treatment vessels to provide continuous readings at different points in the treatment process. The type of meter required at each treatment phase depends on the testing environment and the system in question. For example, reverse osmosis systems are designed to remove total dissolved solids (TDS) from water, so the inline meter installed in this system should be capable of measuring TDS. In addition to inline meters, industrial facilities often require manual water quality spot checks to provide greater accuracy and quality assurance. These readings can be taken using portable meters or conducted in on-site laboratories using benchtop meters. To learn more about Jenco’s array of industrial water quality monitoring instruments and shop for your ideal solution, follow the link below.